I believe the real meaning of our existence is to be found in soil … in its alchemy, in its mystery, in its eros. Terra Illuminata. It’s where life begins and it is where life ends. It’s where death begins and it’s where death ends. It’s the Earth’s skin; the Earth’s exemplary circle. This incredible composition may be thought of as the common soil, but to me it’s a shapeshifting miracle. All those millions of microorganisms interdependent and working as one entity, taking care of themselves, and in turn, taking care of all of us, too. Think of the magnitude of what lies under our feet: “A cloak of loose, soft material, held to the earth’s hard surface by gravity, is all that lies between life and lifelessness,” as said by Wallace H. Fuller, an American soil scientist in 1975. Soil, in my opinion, is not to be sniffed at. Detritus from the farm being used to enhance the garden’s soil. Tobacco scrap is filled with nitrogen, and is used as a mulch on our garden. Halfway through a compost cycle. Compost … before and after. In spite of my belligerent attachment to creating an unsullied organic garden, it is to Chris I turn when I am at a loss. He is, after all, the farmer who first planted this garden … a garden I have since expanded, and now tend alongside Peter Komanyana and Eugene Maingo. It is to Chris I wail when nematodes turn my carrots into deformed fat Michelin men; when my parsnips transform into the shape of turnips. It is to Chris I turn when the leaves of my tomato plants turn yellow and curly, which they suddenly started doing last weekend. He is my consoler and my agronomist, and it was he who imparted the bad news about how tomato crops were succumbing to the yellow curly leaf virus throughout our valley. Earlier this year Chris agreed to build me two raised beds, in an attempt to create what we hoped were containers for a “super-soil” in which few nasty nematodes could survive. Nematodes are microorganisms transported by river water that thrive in our sandy soils, so it’s near impossible to get away from them without using chemicals. Still, I wanted to give it a try. We’ve made a guess that using heavier clay soils — transported to the garden from a part of the farm where they are found — enhanced with compost and nematode-destroyers like worm castings tea, there’s a chance we may control them. It is in the raised beds that I have since planted the delicates like herbs and lettuce; and it’s in the raised beds we are soon to plant our root vegetables, crossing fingers they will grow into shapes that Whole Foods or Marks & Spencers would envy. Building the raised beds earlier in the year. The finished raised beds filled with clay-rich soils, compost, worm castings, and chicken manure sold to us by a neighbor. The variety of lettuces we planted in the raised beds have so far been a huge success. The lettuces, mixed in with basil, carrots, beets and onions as recommended companions, have so far thrived in the raised beds. They are healthy, prolific and a staple in this salad-loving household. Two different friends, one a local farmer and another, an American who lives between Switzerland and the Cotswolds, gave us a variety of lettuce seeds, allowing for an impressive array of textures and flavors to serve each day in our salad bowl. Spicy Mix lettuce with basil, beets, carrots and onions as companions. A favorite dish for Sunday brunch is my Guacamole Salad with Bacon. I chop a small amount of fresh chilli into a smashed avocado, add a dash of lemon juice, a pinch of salt, and lots of cracked black pepper. I serve it on my homemade ciabatta bread, sprinkled with crispy bacon bits, atop a bed of salad. I make up the salad according to what is available in our garden, which I bring together with a simple dressing — olive oil, balsamic vinegar and Dijon mustard — so not to overpower the flavor of the avocado and bacon bits. SavannaBel’s Guacamole Salad with Bacon. A yellow cherry tomato that I am certain is native to this area, so prolific and happy is it. Fennel bulb, which I use in so many of my salads. Our avocado tree has suddenly started producing in the last three years, making us very happy! The Earth’s ingredients exist in us all – we could say we are this Earth. Your blog is just amazing and I enjoy every one – thank you for sharing all your earthy experiences ! 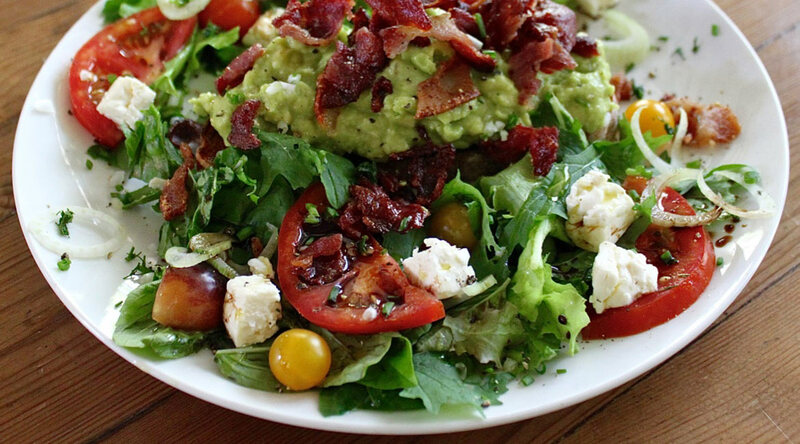 The guacamole and bacon salad looks absolutely delicious and what a triumph all coming from your garden! Surely monkeys must be having a field day with this Garden of Eden?? Thank you for your kind comment, Louise. We haven’t had a single problem with monkeys … YET. The dogs are a good deterrent, and long may this last! I did see a huge baboon the other day, but he was on his own and must have been passing through … probably having been kicked out the troop. Our biggest pests by far are the trumpeter hornbills. They arrive in their squadrons to eat our paw paw! I love the salad recipe. The avo and bacon makes it into a wonderful meal. The raised beds look the way to go. Wow what a magnificent salad deli ! Thanks for sharing all the news. Thank you for stopping by, Hellie … and for your kind comment. The raised beds are very new still, but the produce growing in them is doing well so far. Keeping fingers crossed! Beautiful photographs – loved the ‘grounding’, that delicious looking salad and the magnificent raised beds! Just wondered – have you ever done planting according to the cycles of the moon? Thank you, Georgie! This definitely appeals to the Celt in me … but I’m not sure I can correlate the ‘wet phases’ to this environment. It’s as dry as a bone here! (Unless I’m not getting it, and I need to turn on the sprinklers during those periods?) I’m going to keep researching and see what I can learn … Grazie! Lovely post savannabel. You must know about avocado ice cream? You make me smile , you teach me something , you entertain me ! I love your blog Annabel ! I’m so envious of your garden! Especially with avocadoes! Gorgeous salads. Have you tried growing marigolds and then digging them in as a green crop to suppress nematodes – it really works! Thanks for your useful tip, Adrienne. We grow marigolds throughout the garden, but I have never ‘dug them in’. We have, however, dug in khakibos, which is ubiquitous in these parts, and here’s hoping it helps, too.